By clicking Add Project the template starts to form. The process may take a few minutes, because of the npm intallion. After the project form run it with the Start button and select Watch option in Build button. This feature is going to automatize the build itself. If you click the Earth icon, the Counter application opens in your browser. 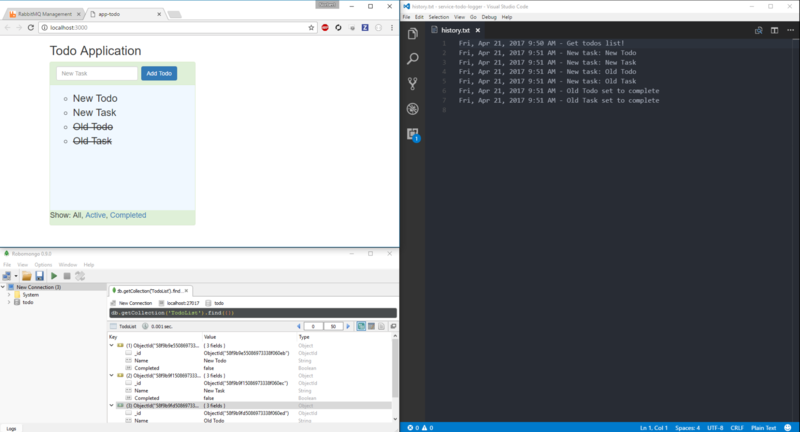 Let’s open the Visual Studio Code with its icon and take a look at project just made. This is a well-constructed project, in which work can be started. The base of the project is CorpJS (About CorpJS: link.) Delete these files in src folder: ./component/Counter.tsx, ./component/Counter.scss, ./reducers/counter.ts. Firstly we need to make actions and reducers. Now place this code into actionCreators.ts file. For the application look nice, insert to following into Application.scss. We need Bootstap CSS, therefore insert to following link into the head of index.html. A browser you may see the application. Refreshing the browser makes tasks disappear. Preventing this let’s male a Rest project. 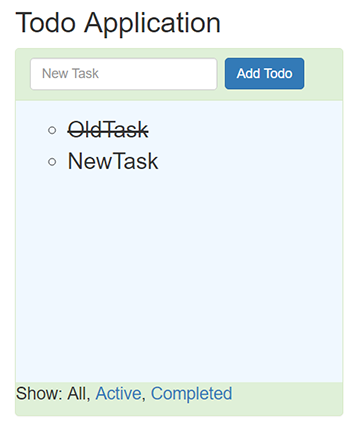 The Rest project stores the tasks to the Mongo database, thus making them available later. So firstly, create a Mongo database named the infra-todo-mongodb. Create the Rest project too, named service-todo-data on the 3001 port. Do not forget to tick MongoDB as dependency. Let’s open the Visual Studio Code with it’s icon and take a look at project just made. We need to two new CorpJS modules. Install them with these commands: npm i corpjs-endpoints --save, npm i corpjs-mongodb --save. Afterwards import these into the “system.ts” file. Add MongoDB to Routers dependencies. Next up “Router.ts”. Add mongodb to the Deps interface. Create a MongoDB collection in the start function and insert the endpoints to the code after the userCollecton variable. Put this code to index.tsx file. When the application starts, this code will load in tasks from the database. Done! Now every modification will be saved to the database. The next project will save all the incoming messages into the history file. The type of this project is Amqp and it requires a RabbitMQ server. 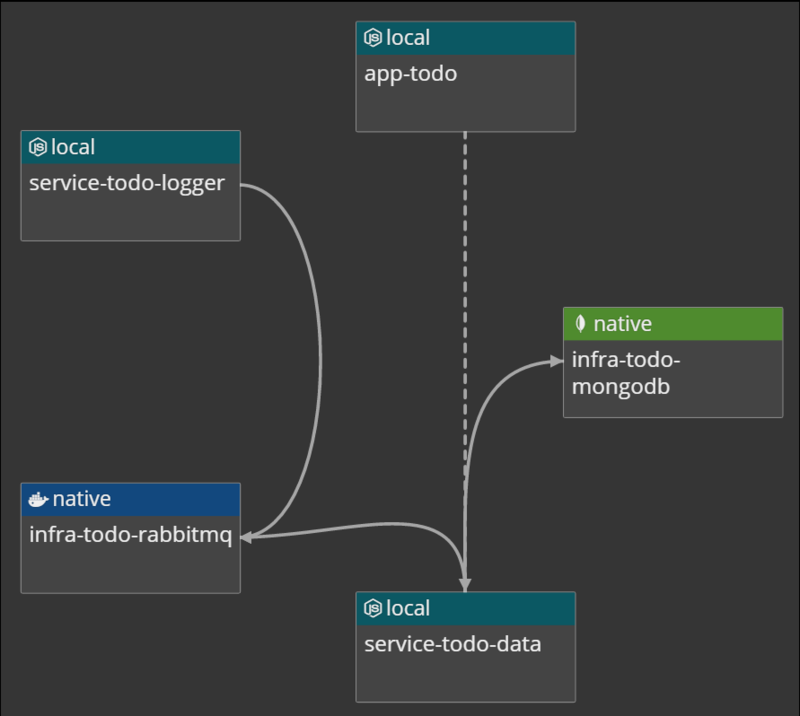 Firstly, create a RabbitMQ server named infra-todo-rabbitmq. Create a simple function into the Consumer.ts file. This function will create the history file if it does not exist. Use this in the Start function. Implement a message save function. We need this module: corpjs-amqp (npm i corpjs-amqp --save). When any of the endpoints are called, it sends a message to Rabbit. Create a file named RabbitSender.ts in service-todo-data project. Add rabbitSender to the Router dependencies. Add mongodb to the Deps interface in the Router.ts file and let’s send some message to Rabbit. const status = req.params['status'] === 'true' ? "complete" : "uncompleted"
Finnaly, set each of the dependencies in the Topology page. Look at the results!